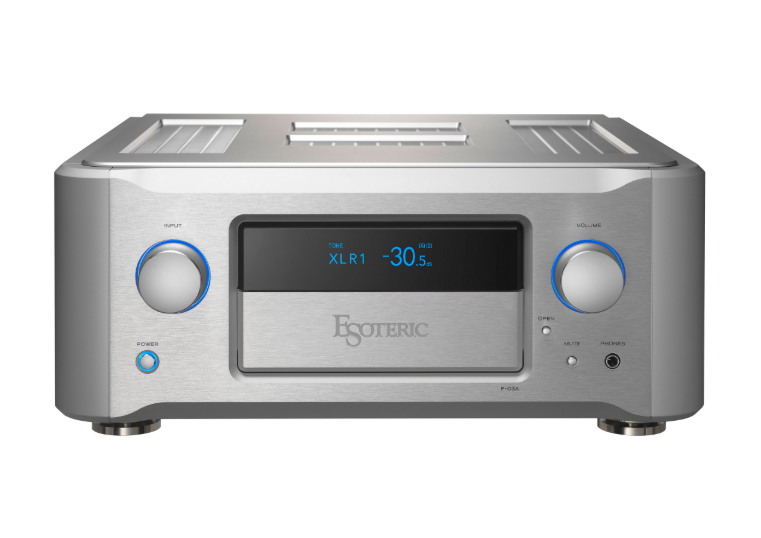 Esoteric’s F-03A integrated amplifier proves the audio truism that not all watts are created equal. With an output power of just 30Wpc, the F-03A isn’t anyone’s idea of a powerhouse. Yet the F-03A’s 30 watts are not only among the sweetest sounding you’ll find; they are also far more potent than those of lesser-quality amplifiers with a similar power rating. The F-03A’s sweetness is provided by its Class A operation, the potency from its robust output stage and power supply. Two amplifiers with the same power rating into 8 ohms “on paper” can have radically different real-world performances. One can sound anemic; the other can sound like an amplifier of nearly twice its rating. In listening to the F-03A for many months through a variety of speakers I can say that for 90% of my listening those 30W were more than adequate. I suspect that the F-03A would similarly satisfy many listeners who wouldn’t have considered an amplifier of “only” 30Wpc. That would be a shame, because the F-03A is an outstanding product that shouldn’t be summarily dismissed from a glance at the spec sheet or an evaluation by the “watts per dollar” criterion. The F-03A is a gorgeous piece of audio hardware, with lavish chassis work that befits the Esoteric marque and the integrated’s substantial $13,000 price tag. It’s packed with useful features, and in its control and operation is never less than stellar. It has a luxurious, premium vibe, from the tactile feel of the ball-bearing-mounted volume and source-selector knobs to the way the fold-down door gently glides open to reveal seldom used controls. The front panel is dominated by a large volume control, identically sized source-selector knob, and a useful alphanumeric display. The fold-down door reveals an extensive feature set including selectable phonostage gain, a balance control, three-band tone control, and an A/B speaker switch. A mute control and ¼" headphone jack round out the front panel. The F03-A’s more advanced features are accessed through a menu system and the front panel display. These features include the ability to select a default volume level for each input, invert absolute polarity independently on each input, name the sources in the display (“DAC” rather than “BAL 1” for example), configure the unit as a preamp or power amplifier, adjust the display and knob backlighting, and set one or more inputs at unity gain as a home-theater pass-through input. The F-03A’s amplifier section can be driven by an external preamp, or you can tap into the F-03A’s preamp-out signal to drive an external power amplifier. I used these preamp-out/power-amp-in jacks to connect a JL Audio CR-1 subwoofer crossover for some of the audition. The rear panel reveals a generous input and output complement. Two balanced and five unbalanced inputs are provided, along with balanced power-amp-in jacks and both balanced and unbalanced preamp-out jacks. A rear-panel opening can accept an optional DAC board ($1200) that is compatible with any PCM format and DSD up to 11.2MHz.